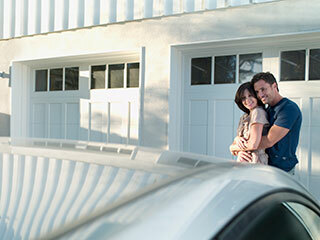 You have a nice garage door, and it works great, but something's missing. How about kick it up a notch? With little effort and a lot of creativity, you can make your garage door into a piece of modern art. Here are four tips to make your door a pleasure to watch! If you don't want anything too drastic, there is always the option of picking a nice paint color on the door. There are many colors to choose from and it can be as bright or subtle as you wish. Also it can completely change the way it looks without anything too drastic. For the more adventurous garage owners out there, there is a more special decoration. Wall stickers can have any kind of design from an airplane, road, and field of flowers to any other thing you'd love to have on your door. Just get creative and google, draw or imagine the most amazing images and your door will be the talk of the town! If you, for example, have an authentic wooden door and don't want anything directly on it you can always decorate around it. There are beautiful plant decorations that would make it stand out even more without ruining authenticity! Also you can place potted plants next to it and give your driveway a 'garden' feel. Of course you can also play with the door's design itself. For example adding glass to it, small windows at the top or center of the door can give it a unique look. It will also light up the space inside the garage. Installing windows and glass panels is the most expensive offer by far, but it's definitely a classy, modern and sophisticated way to spice up the looks of your door.